Please scroll down for more photos. The Musashi forge is known for consistently producing functional and stylish katana swords with an amazing value combined with stunning performance. Our new Folded Elite series continues to raise the bar by offering differentially hardened folded steel blades combined with unique fittings. Completely handmade with close supervision and attention to detail, these swords are designed to be collection and dojo center pieces. Both 1045 and 1060 high carbon steel are fixed together and folded eleven times resulting in 4096 layers. The steel is then shaped into the blade geometry and clay tempered to produce differential hardness and a true hamon line. The temper process also produces an edge hardness of 58RC. Now in its final stage of production, the blade is hand honed for an impressively sharp edge, highly polished, inspected and coated with protective oil. 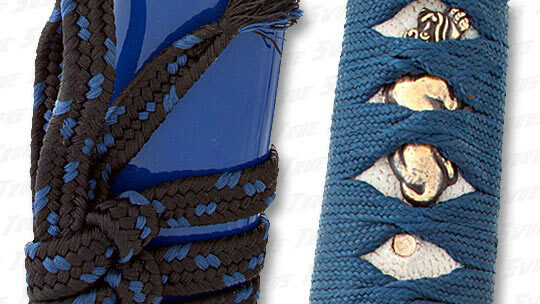 The hamon line detail is on the multi-steel layered blade. The hamon line distinguishes between the harder edge steel and the more flexible spine steel, marking where the metal changes its hardness. The layers of steel are made visible along the hamon line, resulting in a beautiful and unique layered wave hamon. Fully functional samurai sword work of art. Stunning workmanship and attention to detail. Folded high carbon steel Damascus blade with 4096 layers. Clay tempering process with water quench. 58 RC edge (HA) hardness, 42 RC spine (MUNE) hardness. Real ray skin with cotton/nylon cord wrapped grip. 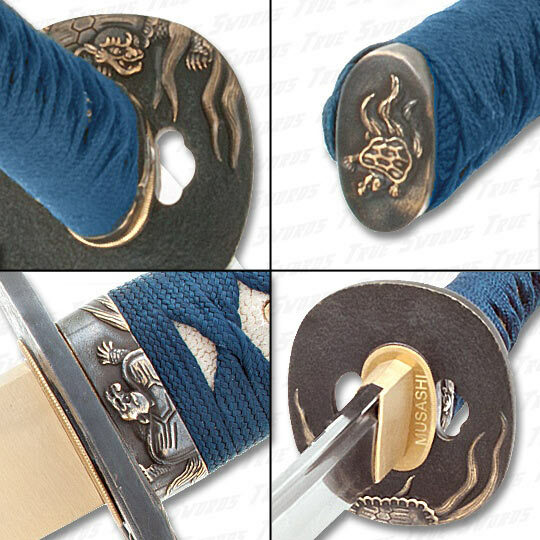 Brass Tsuba, Fuchi and Kashira. Hardwood handle with dual bamboo pegs. 40.5 in. overall, 27.5 in. blade, 11 in. handle. Comes serialized with Certificate of Authenticity. Includes hardwood case, black sword bag and cleaning kit. My katana finally came in this afternoon. It really is a very nice piece. It came well oiled and wrapped in saran wrap in the Saya. All hardware is very tight, the Tuba and Ito is wrapped very tightly and is nicely done. The blade was well executed and the edge on mine was serviceable, however just five minutes with my Accusharp sharpener brought it to a fine razors edge. It now slices paper like a razor blade. I am very happy with this sword and would recommend it to others considering this item. Now I have to clean it, buff out the blade and oil it up. This is truly a five-star blade, easily worth twice the price or more. Cuts are clean and precise, and mine has performed against targets not recommended for the grade of steel, cutting easily through 1.5 and 2 inch bamboo. If you're in the market for a bargain, grab this one while it's still available! 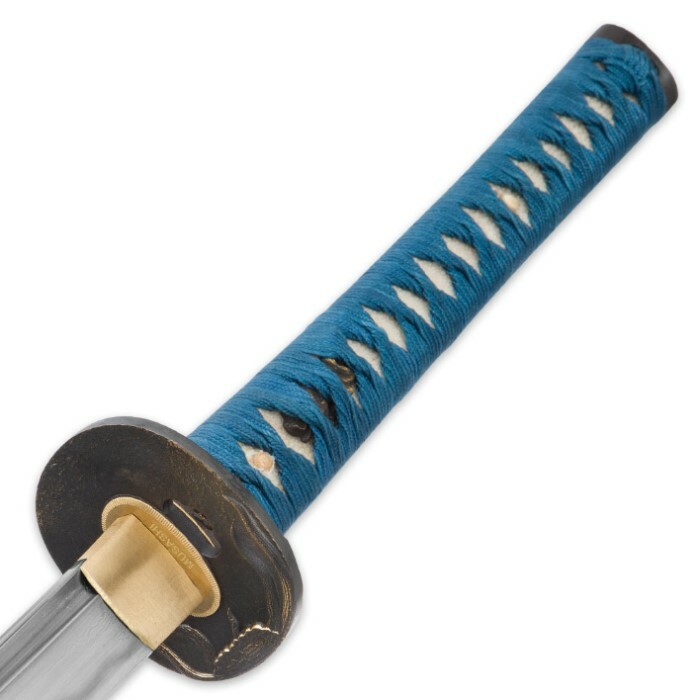 I got this sword a bit ago and love it every thing is tight the Harmon is subtle but reall. The factory edge is ok but if you know what your doing you can sharpen it enough to shave with no joke. Really nice sword for the money. Very well balanced. The blade is beautiful to look at. 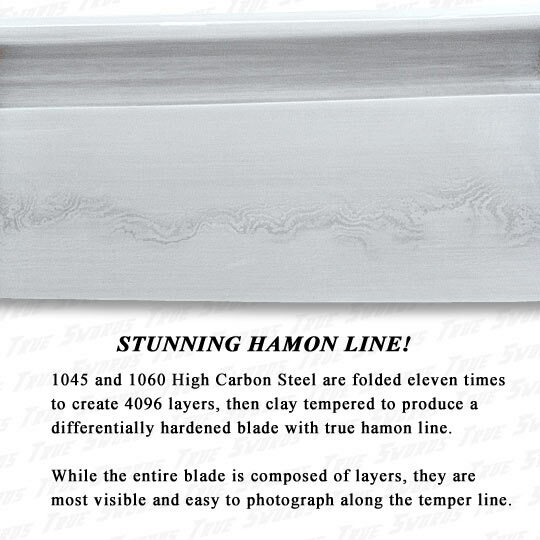 The hamon is incredible. It took some oiling and a little polish to really shine. I will post pictures and a review on Amazon also. Worth the money for the step up from the Musashi Silver line, which is also great and I practice with the Elegant Crane model all the time. Musashi and True Swords make a great team. Great products and prices! Ive got my eye on the san mai model as we speak! Ordered one for myself and one for my daughter as an early Christmas present. We were very pleased with our swords. Both are tight, beautifully presented and had no flaws we could detect. Also bought the three sword Musashi stand and they look great on display. They shipped together and arrived ahead of schedule. Can't wait to try out the cuts. If you are looking for a great first sword - this will certainly fit the bill. I just received my Midnight Kame Katana. I can see why this sword it is rated so highly. I never expected to own a sword of this quality for the amount of money it cost. I was willing to play a couple of thousand dollars for a very nice sword but this sword is good enough... for now. The craftsmanship is very good, everything fits well and is solidly built. The blade is strong, heavy and straight, sharp but can even be made sharper. Thanks True Sword Company for not "sticking it to us buyers." You have great products at more than fair prices! I Salute you and will continue to buy more swords from you! Superb quality for this price range. Sword is well balanced, no rattles, great looking blade. Needed only a little honing to be razor sharp. This was my 7th katana from True Swords, and is one of the focus points of my collection. In addition to the quality of this piece, The True Swords customer service level really sets the bar high. Great response time, shipping is quick, and the packaging is always superb to prevent damage in transit. 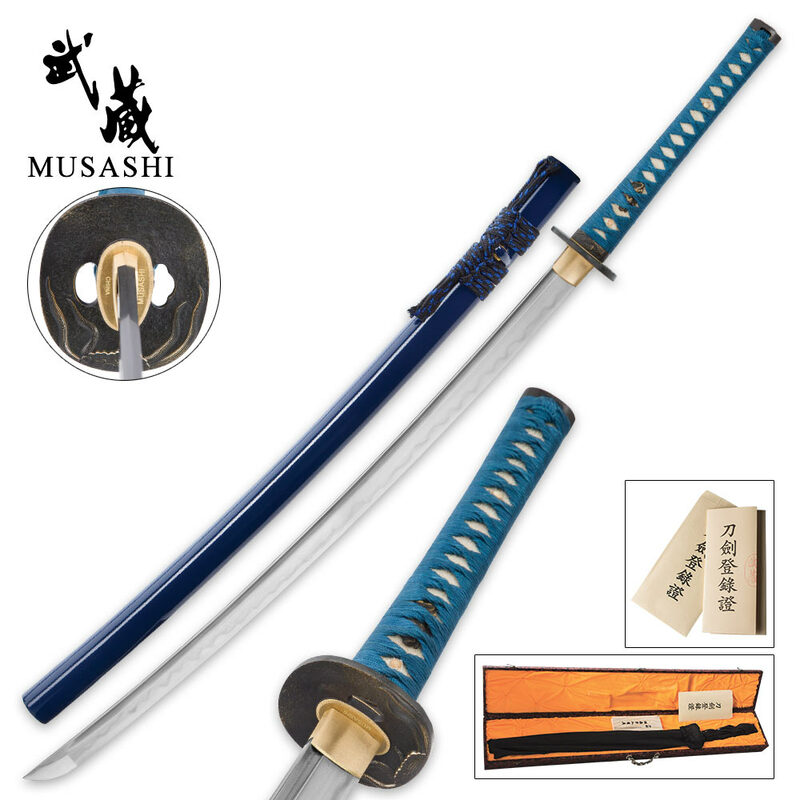 not worth the price, Musashi really let me down on this sword. Blade "looks" well made, the rest of sword is lacking craftsmanship. 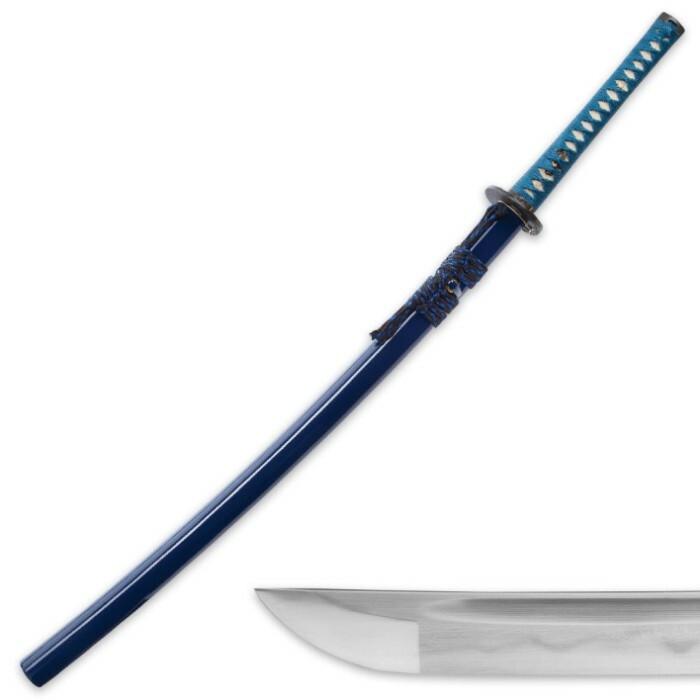 Best katana for 200 dollars period.